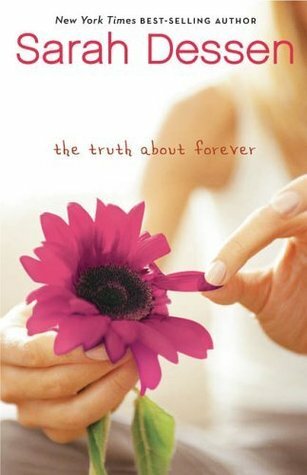 9 of 10: I loved The Truth About Forever. Extremely readable, likable characters, and more substance than you’d expect from a book that would generally be categorized as a young adult romance. February and March quite accidentally turned into the months of Sarah Dessen. I read Lock and Key at the end of January and when I reviewed it, practically everyone who responded said I had to read The The Truth About Forever or Just Listen or This Lullaby. And because I do whatever you lovely commenters tell me to, I ran right out to the UT library and picked up The Truth About Forever and This Lullaby. I won’t bore you all by ranting on about how I love Sarah Dessen, but I will say that I have now read all but one of her books now and that last book is sitting in my library basket waiting to be read. So yeah, it’s pretty obvious that I think she’s terrific. And The Truth About Forever is far and away my favorite of her books. In fact, when I went back to the UT library to pick up yet another of her books, I saw it on the shelf, sat down in the stacks and reread all my favorite parts again. I am a sucker for a good love story. Macy’s dad died a year or so earlier of a heart attack and her life is so shaken by this event that she goes to great efforts to control the rest of her life. She is a perfect student and has gotten herself a perfect boyfriend – a know-it-all/has-all-the-answers, but also nice guy, Jason, who is now off to spend the summer at some sort of brainy-kid camp. After a few weeks of him being gone, she drops the bomb on him in an email, signing it “I love you.” And whoa, does Jason freak out. He writes her back saying something about how they should take a break and reevaluate their relationship at the end of summer and see if they have similar views on their potential future relationship. Macy is not happy about this, of course; she can just see her perfect and controlled life crashing down around her. In the middle of her breakdown, Macy accidentally lands herself a job working with Wish Catering and it is everything she is not – chaotic, unplanned, and loud – but its also surprisingly fun, and no one there really knows about her dad or her perfect persona. It’s also a family business and one of the nephews who works there, Wes, is so good looking she can hardly believe it. Wes turns out to have a girlfriend who is currently in jail, and she will be released at the end of the summer. So there they both are with relationships on hold until the end of the summer. To Macy’s surprise, they become friends and one night, when they run out of gas driving the Wish van after a party they’ve catered, they start a rather strange game of Truth where they take turns asking questions about anything they want and then answering truthfully. She knows about why he went to juvenile detention for a few months the year before and he knows why she doesn’t run anymore. This book has several things going on besides the friendship between Wes and Macy and all the threads come together to make a really engaging and well-developed story. There were even some scenes so hilarious that I had to read them aloud to Bart (after giving him a rundown of the 200 pages previous to the three sentences I was going to read him; the man has a patient soul). I lost a sibling when I was about Macy’s age, and I know all too well about the awkwardness that comes after people find out that there has been a death in your family – the way there is nothing to say and the simultaneous desire to talk about it and to change the subject quickly – and Sarah Dessen captures that amazingly well. When I wrote about Lock and Key, I said I liked Sarah Dessen but it wasn’t like she’d shot to the top of my favorite authors list or anything. Except now she kind of has. I love her books because not only are they generally nice feel-good romances, they have so much character and depth to them; they don’t feel fluffy. I am ripping open the boxes of new Notable Book titles every day hoping against hope that an advanced copy of Along for the Ride, her new book coming out this summer, will be in there. So far no luck. I’ve read so much good stuff about Sarah Dessen’s books-I need to put her on my to-read list!! Thanks for another great review. Sigh. I love that book so much. I’m so glad you liked this one! It’s one of my all-time favorite YA novels. You write the best reviews! When you like a book, I want to run out and get it. You are a fantastic at readers advisory! You know, I still haven’t read any Sarah Dessen. What is wrong with me?? Your reviews of her books have convinced me that I need to rectify this little oversight soon! I see (on your sidebar) that you are currently reading City of Ember. I look forward to your thoughts. I have a copy sitting in my leaning tower of TBR books. Yup. I need to read it. I am currently reading this right now. I didn’t read the whole review because I didn’t want it to give anything away, but I look forward to reading your thoughts on it when I’m finished. So far I like it, and it probably just gets better. So this is the only Sarah Dessen book that I have read. I read it on a recommendation from my sister. I agree, a very good story. So my question is, which other ones should I read? Will I be disappointed that they aren’t as fabulous as this one? We went to Borders the other day and while I was following my kids to the children’s section, I found myself staring at the Young Adult section. I recognized author names and book titles, like The Graveyard Book and actually Sarah Dessen. Like I felt like I was in the know. Thanks for the book reviews. I think one of the many I have on hold might come available soon. Just one like would have been fine. I’ve never read Sarah Dessen before, now I’m intrigued and will have to check her out. Great review!